Sunday, November 3 at 3pm - S.G. Browne, Fran Friel, Loren Rhoads, and Rain Graves read selections from The Haunted Mansion Project: Year Two at the Borderlands Books Cafe, located right next door to the bookstore. Q&A to follow, with information on the next retreat (sign-up available), and books for purchase and signing. 866 and 870 Valencia St. I will be at KillerCon in Las Vegas, NV this weekend (arriving late on Friday night), participating in panels, readings, signings, and whatever else comes my way. I will also be on hand to discuss The Haunted Mansion Writer's Retreat and books. Anyone wishing to sign-up for 2015 may do so through me. 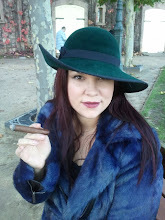 I will also be doing tarot readings as time allows - probably all day Sunday. Drop me an email if you'd like a 15-30 minute slot before 3pm on Sunday, or sometime on Saturday (not below mentioned). As always, if you've had a reading by me before, you get a discount. (And of course...various unscrupulous and infamous parties, Friday and Saturday). 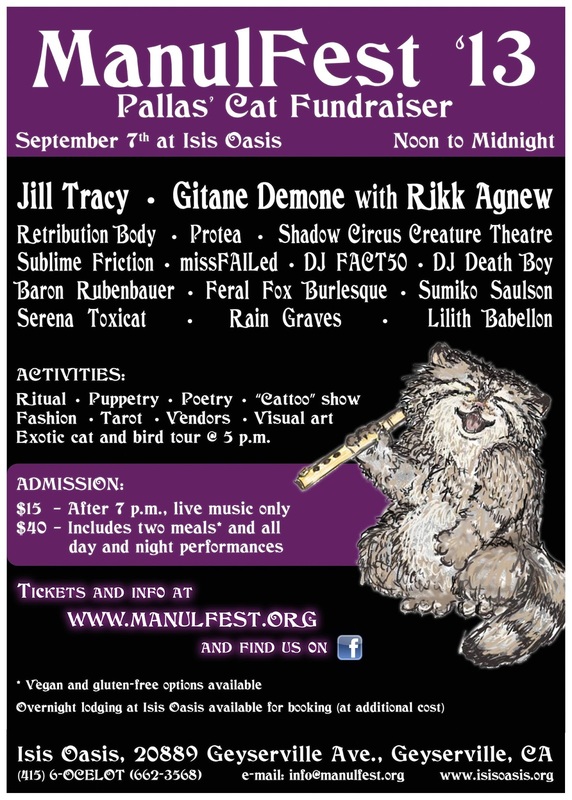 I will be doing a Poetry Reading and discounted (for charity) tarot readings at ManulFest, a benefit for Pallas Cats, at Isis Oasis in Geyserville, CA this Saturday, September 7th. The event will be featuring live music, poetry, djs, plays by: Jill Tracy, Gitane Demone with Rikk Agnew, Protea, Sublime Friction, Shadow Circus Creature Theatre, Retribution Body, Baron Rubenbauer, DJ Death Boy, Rain Graves, Serena Toxicat, Sumiko Saulson, DJ Fact.50 missFAILed, Feral Fox Burlesque, and Lilith Babellon. 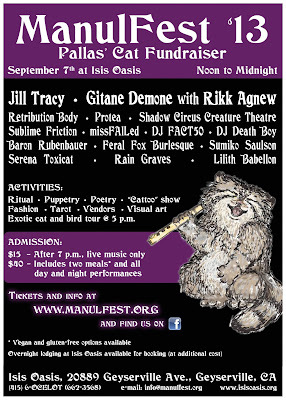 You can view the full line-up schedule of bands and information on performances at the ManulFest website. Ride-share forums and overnight discounted accommodations are available. 1pm-3:30pm - Tarot, Medium, and Goddess Consultation readings every 15 minutes. Sign up in advance via email, or on-site. 6pm-8pm - Tarot, Medium, and Goddess Consultation readings continued. New Review of Four Elements & Release Date for Haunted Mansion Project: Year Two! 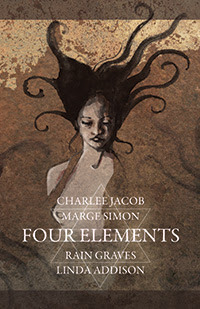 There is a great review of The Four Elements by Linda Addison, Charlee Jacob, Marge Simon, and Rain Graves (2013, Bad Moon Books) at The Horror Fiction Review . The Haunted Mansion Project: Year Two, edited by Loren Rhoads and Presented by Rain Graves will be available in eBook format first, at 12:01am on 6/13/13 at World Horror Con 2013 and Bram Stoker Awards Weekend. 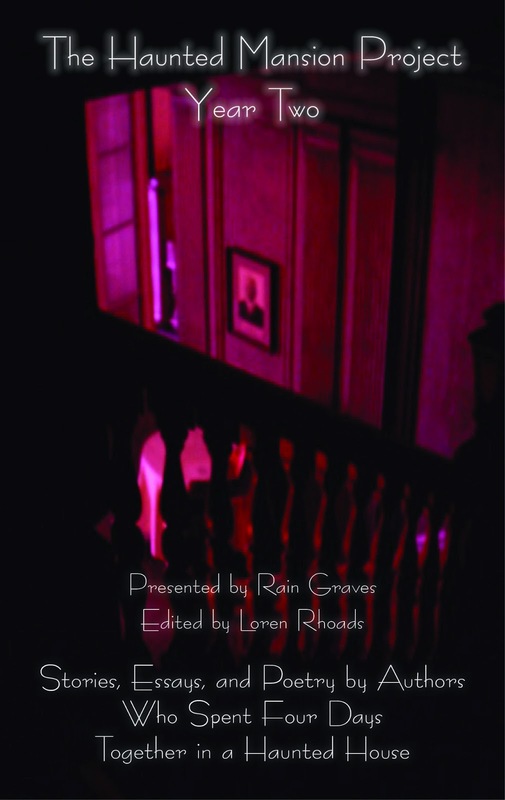 Here's the spiffy cover art, which is a full spectrum photograph taken by Nikki Boscia of Ghost-Girls, looking down the stairwell into the foyer of the house. Keep your eyes peeled at the witching hour for the release, over at DamnationBooks.com. The Four Elements (with Linda Addison, Charlee Jacob, & Marge Simon). January 2013, Bad Moon Books. Now available! Trade paperback: $17.95. Signed Limited Edition Hardcover: $35.00. eBook to be announced. 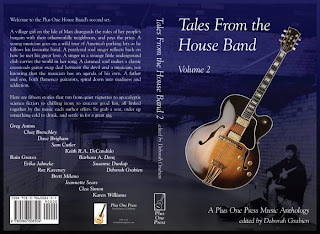 Tales from the House Band, Vol. 2 (Plus One Press, Dec. 2012). My short story, "Star Light, Star Bright," is included. $16.95 Trade paperback.